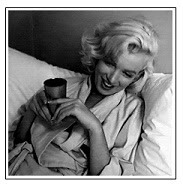 When I get quiet on Coffee Talking you might think I'm enjoying life, sitting around sipping hot coffee and relaxing, right? Uh, no. Life is so busy right now that I have to remind myself to stop and breathe but in the middle of it, what do I choose to do? Embark on a little home improvement project. I am currently smack-dab in the middle of a counter top project in the master bathroom. The previous owners had burnt the bathroom counter with a hair straightener. The white counter was marred with 5 golden yellow burn strips. 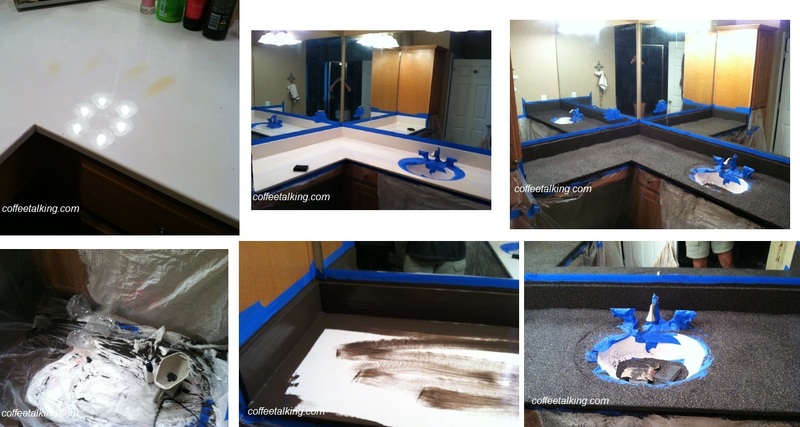 It was during a trip to the hardware store I spied the kit for Rust-Oleum Countertop Transformations . I debated whether I was up to the task, but in the end, $250 for a kit sure beat buying and installing new counter tops. IF YOU ARE CONSIDERING THIS PROJECT: I spent too much money on the kit at the hardware store. I found it much, much cheaper online at Amazon (link above) and when I found the link it also offered free shipping. $207 at the time of this posting - much better than the $250 I spent with an additional 10% sales tax on top of that!!!). Will update later with finished project photos. We bought a Mini Keurig Personal Brewer for Traveling and Loved it. This past weekend was spent traveling through 7 states and back again, all within 4 days. We had a family celebration to attend and although we drove straight there (18 hours) we then stayed in a hotel 2 nights and took our time coming home to break the trip into two days and stayed in a hotel on the way back. As wonderful as a hotel bed feels at the end of a long day of driving, there is something the hotel offers that isn't good. Their coffee. No matter the hotel, brand, location or how nice of a hotel it is, they all seem to offer coffee packets for the rooms and fresh brewed coffee in the lobby that tastes to me, like cigarette ashes. Having been a Keurig owner since 2005 (?) we've actually brought our large, full sized Keurig on vacations with us. We had saved the box it came in for ease of packing and sure enough, it's been to the beach in South Carolina, it's been a part of family vacations to the gulf in Alabama and it's gone to the very southern tip of Texas as well as traveling up north towards Minneapolis. But last week I decided it was time to let our counter top Keurig be just that; a counter top. It was time to finally invest in the hundred bucks in a smaller sized, more easily packed, mini Keurig system for traveling. 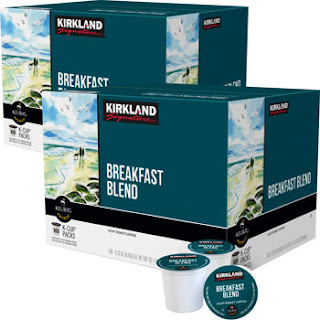 We purchased the Keurig K-Cup Single Cup Coffee and Tea Brewing System - and I admit I probably would have gotten a fun color like red or yellow, but we purchased ours at Best Buy and they only had the black model. We purchase our appliances, computers, electronics and small kitchen appliances from them because we've found the Black Tie Protection plan to be invaluable - however, this post isn't about where you purchase yours - it's just to let you know if I liked it or not! The smaller Keurig is a little sister to the counter sized. It does not have a water reservoir to hold water long term so you fill it up each time you use it. You have a choice of sizes; 6, 8 and 10 oz. and it comes with the drip tray, an auto on/off feature and something simple but I love it; cord storage in the back! 3 Brew Sizes: 6 oz, 8 oz. and 10 oz. 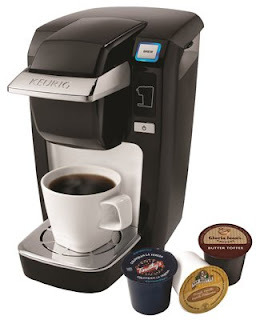 Using the Keurig was simple, but it is a little bit different than the full sized versions. In this model you turn on the power when you need it (as compared to leaving it on all the time). You then open the top, pour in the amount of water you need based on your single cup size and close the top. Instead of using the little cup icons in the water reservoir, it's easiest to simply fill your mug or cup and pour it in - thereby getting the exact sized cup of coffee that you want. Open the top, insert a k-cup of your choice and then close the top. This will cause the water to drain down into the machine to be heated. Press the 'brew' button and... wait. It will blink red and if you are impatient or haven't read the instructions you may think it's not working. It is. It will blink red while the water is filtering through and then being heated. This can take up to 2 minutes. It will turn solid red when it is dispensing the coffee into your cup. That's it! You now have a fresh, hot cup of coffee of your own favorite brand, roast and flavor. Although we packed the Keurig in its box for this trip, for future trips we plan to simply pack it into our suitcase for ease of travel. Currently the box rode quite nicely on top of the rolling suitcase, resting against the handle as we pulled the luggage into the hotels, however in the future, just to reduce the number of items to carry, I will be placing the coffee brewer in a recycled grocery bag, and placing it in the suitcase, cushioned by the clothing and will simply unpack when we arrive at the hotel. This is also the same model I was looking at purchasing for my desk at my previous job before we relocated to our new city and state last year. If I decide to return to the workforce here in our new stomping grounds, this little guy will be making his home on my desk in my new office without fail. Office coffee is even worse than hotel coffee - who would have thought that would be possible! Repost: because I found it interesting! These are some serious coffee barista's and customers! A version of this article appeared in print on May 15, 2013, on page D3 of the New York edition with the headline: Want Coffee Brewed Your Way? Be Specific. When Starbucks installed its first espresso bar in downtown Seattle, in 1984, it effectively reordered the hierarchy of coffee in this country: brewed coffee might be nice, but nothing beats the theater of a latte. Today, many coffee nerds feel differently. Espressos are tasty, and a cappuccino is a pleasurable indulgence, but the real magic is found in a cup of black coffee prepared to order with beans from the latest harvest: the new crop of Central American coffees that is arriving now, and East African coffees that will be here come summer. When members of this generation of fanatics step up to a brew bar, it’s not to look for something familiar and comforting; it’s to try something new. Two coffee bars opening in Manhattan reflect this ascendant interest in brewed coffee. This week Stumptown Coffee Roasters reveals its most ambitious project to date. The company spent nearly $1 million to transform a neglected Greenwich Village storefront (it was once the Eighth Street Bookshop, a literary hangout that closed in 1979) into a coffee shop with unusually sumptuous details: coffered ceiling, walnut bar, custom wallpaper screened by hand in Portland, Ore. The shop includes a separate brew bar, where you may order any coffee in the catalog prepared on your choice of gadget, including AeroPress, Bee House, Chemex, French press, siphon and V60. The brew bar is as much a workshop as it is a place to get a coffee and buy some gear. There will be demonstrations, free cuppings and an easy flow of jargon-laced conversation. If you want to learn how grind size affects extraction, here’s your chance. Next week, Intelligentsia Coffee will open a coffee bar off the mosaic-tiled lobby of the High Line Hotel in Chelsea, a former seminary that dates to 1895. In addition to offering a daily coffee on a pour-over bar equipped with Wave drippers from the Japanese manufacturer Kalita (the current darling of high-end coffee), the baristas will select a second coffee that they think “pops,” said Stephen Morrissey, the director of communications for Intelligentsia. Then they will choose a preparation that suits those beans. “When the morning shift comes in at 5:30 a.m., they’ll cup the coffees,” said Mr. Morrissey, who won the prestigious World Barista Championship when he was working for Square Mile Coffee Roasters in London. “Then they’ll pick how to make it. It’s not that one brewer is better than another brewer. It’s that they might decide, ‘I’m loving the toffee notes in this, I bet it’ll be awesome in a Cafe Solo,’ ” he said, referring to a kind of brewer. Not all brew methods are created equal. Some use thick paper filters that create a cleaner cup, others perforated metal filters that let through the oils and fine sediment that create a richer texture. A dripper might be shaped like a cone (the V60) or a wedge (the Bee House) or a cup (the Wave). The details can make a difference. Even if there’s no one right way to prepare coffee, different methods lead to distinctive flavors. This is the first New York outpost for Intelligentsia, which was founded in Chicago in 1995 and evolved from a neighborhood shop into one of the industry’s most influential coffee companies. It’s the second New York shop for Stumptown, which is based in Portland, Ore. In 2009, Stumptown opened a coffee bar at the Ace Hotel in Midtown that has about 1,250 customers a day. The two companies are tiny when compared with the industry’s heaviest hitters: this will be Intelligentsia’s ninth location, Stumptown’s eighth. But both are pioneers of direct trade, and were among the first to travel to the countries where coffee is produced to shorten the feedback loop between the farmer and the roaster. Both maintain a network of expert buyers who procure some of the finest coffees in the world. Even if they are fierce rivals (for all they have in common, there’s little collaboration between the two), each fixates on what is unique about the coffees it goes through so much trouble to source. And while both are shining a spotlight on brewed coffee, neither is abandoning espresso — they are equipped with tricked-out machines. You can try out a brewed coffee you wouldn’t normally order, and have your latte, too. Intelligentsia Coffee, the High Line Hotel, 180 10th Avenue (West 20th Street); (212) 933-9796; intelligentsiacoffee.com. Stumptown Coffee Roasters, 30 West Eighth Street (Macdougal Street); (646) 590-2376; stumptowncoffee.com.